I have had discussion on how much of the teams are actually doing SCRUM. I think many organizations do SCRUM, since in a big organisation there is always at least one team who does SCRUM, but that does not mean that other teams are not doing traditional development. Still there might be teams that say they do SCRUM but only use a board, and not the principles and mindset. 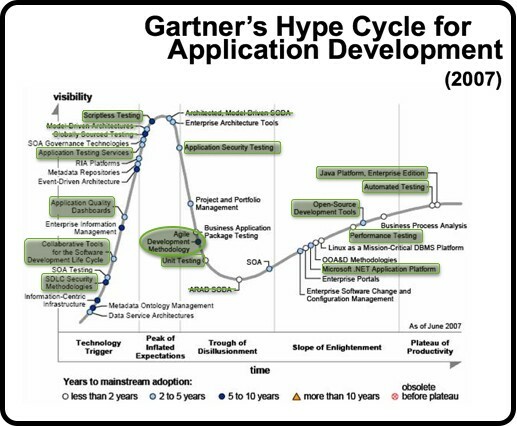 The Gartner hype curve from 2007 predicts that Agile will be mainstream adopted between 2012 and 2017. So now is a good moment to asses where we stand with SCRUM adoption. From my experience I’d say that the majority of teams are still not developing according to SCRUM. So I’d guess that 30-40% of the teams are using SCRUM, and 60-70% might have some knowledge but do not practice it. But although I meet a lot of people from many companies, my reference is of course limited. What do you think? Do I hit to high or to low? Please, give me your opinion. On my LinkedIn I posted the same question. I got some reactions of people saying that there of course organisations that say they do SCRUM, but actually…. Does anyone dare to share is idea on how big this last group is? Say x procent? You might be off, but I think little people really know, and it depends on the context anyway. So there is no wrong answer. Isn’t it more interesting to know how many teams practice some flavour of Agile instead of SCRUM? At least your c option should be divided into ‘ teams that follow other Agile methodologies’ and ‘teams that don’t practice Agile’. In my organisation every development team follows SCRUM or Kanban or a mix of the two. We have about 18 teams with 5 developers and 1 QA in each team. I don’t really want to go that way, since I want to have some bench-mark my impression on how many teams adopted SCRUM/Agile. But then, yeah, If you mix SCRUM with Kanban, that still counts if I am to decide. So you work in a organisation where all teams have adapted to Agile in some way or the other. You answered my question: 100%. Thanks ! May ask what kind of organisation or domain your are working in? I would consider that a team is doing Agile if they embrace the agile principles though I understand that it’s a more difficult question to answer. The problem is not only what to consider an Agile practice but also teams that are following an Agile methodology but really aren’t. At my organisation we work in the betting industry in one of the biggest online betting sites. In my organization there’s currently a pilot for the SCRUM methodology (by water-scrum-fall), the rest of the organisation is supposed to develop according to the waterfall method; but it’s actually a sort-of-waterfall-where-agile-adoptation-is-done-when-it’s-beneficial-methodology.